Anyone, who train some kind of martial arts, wants to improve it and obviously, there are lots of reasons. There are also LOTS of ways to do it and in this content, you will find ways for how to punch harder and faster. When you implement these methods, your punch will be more powerful than ever. Also, there has been an ongoing discussion on forums about whether we should lift weights or not. You can also find the research based answer. Even though you have very powerful punch, you won’t maximize the impact without proper punching technique. Firstly, you should practice how to throw hook, cross, uppercut… and be expert about these. So, you will know which one of these will make the highest impact and when to do it. You can practice hook and cross with heavy bag and you need double end bag for uppercuts. There is a proven stance for making your punch power as much as you can. Firstly your feet should be positioned slightly wider than your shoulder width. Knees are slightly bent. If you will punch with right hand, right foot should be positioned at slightly back like in the picture and right heel should be slightly lifted. Left foot is flat and pivoted. Also, your left toe should point to your target. When you punch, you should rotate your hips and torso as much as possible. In this way, you will be able to deliver the highest impact. Shadowboxing is a great way to understand how you should do “the punch” and see your errors. You can get fast by doing actual movements like jabs, uppercuts, hooks etc. After you get used to it, you will start doing these movements “autopilot” and very easy. When you get that point, you might want to increase the intensity of your workout. Normally, I don’t like Adidas Boxing Gloves. Don’t get me wrong. Adidas has amazing sports t-shirts, boxing shoes etc. but when it comes to pairs, I don’t train with them. With that, they have a pair which is purely developed for shadowboxing. When you train with this pair, obviously it will be harder to punch and after you will get used to this pair, your punches will be faster. If you are interested, then check out its review. I know that some people use weights during shadow boxing, obviously, these do not have ideal weight distribution. Even it will make you faster, this will actually hurt your punching technique and I highly recommend you to stay away from it. 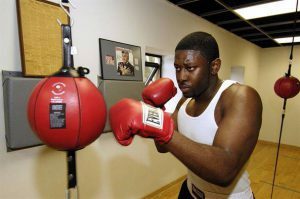 Shadowboxing, speed bag training mostly increase your speed whereas your body will have very tough workout with heavy bag. Your muscle tissues will get denser and it happens when you practice punching skills. It is truly amazing. With that, you don’t want to harm your wrist or your knuckles during the training. So, always use boxing hand wraps and right gloves. When you throw a punch, your wrist and knuckles have high impact. Some gloves can protect you, also deliver the shock quite well and heavy bag will literally swing more after your punch. If you think of doing this training, then definitely check out these pairs and their exclusive features and you will also need quality hand wraps. Heavy bag also helps with the positioning, as it swings, you position yourself according to it. In that way, you will know the ideal distance for your punch to deliver most impact. Double end bag training is very similar to speed bag training however it also improves your strength. When you hit a speed bag you barely get resistance. With that, double end bag will give you a little bit more resistance. In that way, you will have resistance and speed training. Most importantly, you will have a chance to practice uppercut and improve the impact of it. There is no other place which can give you this opportunity. As you get expert, you can increase the tension on the cable. So, it will be faster and will give you more resistance at the same time. This is the main place for improving speed and accuracy. If you are a beginner, you can start with 8” x 11” size and when you can easily make combinations while doing footwork, then it is time to move on a smaller size. It will challenge your hands and eyes more. So you will get faster and faster. I have seen lots of people, who train boxing or martial arts, punch heavy bag with their running shoes. I even witnessed that they lose balance during a session. Punch start with foot and end with your fist. Without proper balance, you can’t maximize your “punch power”. These kinds of shoes are simply not ideal for footwork. Whereas, boxing shoes will wrap your wrist quite well and also provide you balance. 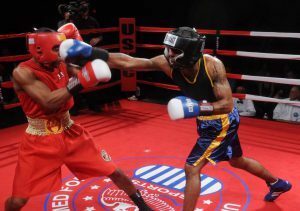 This is why cuff part is long and designed exclusively for boxing. It will help you punch faster, stronger with more balance. We all know that if we focus we can punch better and psychology-today’s research also proves that. Eyes should be all the time on the target. In that way, your punch will have more impact. 9. Should You Lift Weights? Alright, I read lots and lots of things about this subject. Most people just stated something and don’t have any researches and any reasonable explanation behind it. With that, I found some researches and experiments hopefully I can make some clarification about the subject. 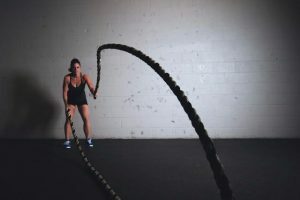 According to Connectsavannah‘s research, there were Olympic Boxers in weight classes ranging from flyweight to super heavyweight in the experiment. All of them punched an item which has pressure measurement points. Not even one heavyweight, who have relatively more muscle mass than other classes, made the top 5. Now you are probably saying, we should not lift weights. Well, not so fast. Research also shows that the muscle density is correlated to punching power. So, having dense muscles is the answer that we are looking for. For having it, your rep range should not exceed 6 reps. Above this range goes in the hypertrophy range and it will make muscle but not dense as you would like. all, isometric training also makes the muscle dense and some common isometric training types are plank, overhead hold, isometric push up which you can do easily. It is also a fact that many people, who do Boxing or MMA training, and professional fighters started slamming battle ropes religiously. It increases your explosive strength greatly which translates into punching power. I also know a myriad of people in boxing gym benefit from it greatly. My punching power also has awesome improvement with it. If you are interested doing really challenging workouts and improve your punching power, then check out these good quality battle ropes. All boxers jump rope like crazy and they are very right to do so. It is one of the best exercises for improving your speed and it provides an incredible condition. As a result of it, you will have more endurance and you can train more. In that way, obviously, you will have faster and harder punches. I gave jumping rope exercise as an example because boxers have been continuing it for decades and it is very suitable training who train boxing or martial arts. Breathing is important for every sport types and it is the main factor for durability. It can literally save you extra minutes in your training. Always breathe through your nose. According to Charlotte North Carolina Facility, when you breathe through mouth, brain thinks that carbon dioxide is disappearing and it commands cells to store it during mouth breathing. Obviously, it is not good for energy. According to university studies which are made for Mastery Mind-Set ( a famous book about Martial arts, by Craig R. E. Krohn), hands move faster when we are relaxed after we exhale. With that, you should not contract muscles before the punch. It will make you lose energy and uncomfortable. In the book, it is also recommended that you should contract muscles and fist just before the punch. In that way, you will be relaxed throughout the movement and it will increase punching power significantly. When I first heard this, I was not sure about that, but it does. You just need a couple of training sessions to fully implement it. 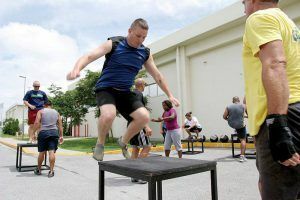 As you know improving explosive strength improves your punching power but many people forget that you can also improve explosiveness of your lower body and one of the best way(according to me, it is the most effective) to do it is plyo box training. You can also track your progress with an adjustable one. If you are interested you can have a look at these best plyo boxes and I also included a very quality workout video so you see what you can do. All these methods will surely improve your punching power. However, I experienced the biggest change after speed bag training sessions. Have you experienced the same or if you have not, which one is your favorite? Previous post: Speed Bag or Heavy Bag Training – Should You Pick Only One? This is all good to know. I’ve been considering taking up boxing, but not sure if I am too old… I’m 32. I also live in an apartment so I’m not sure where I could hang a bag. But it is definitely a good thing to know how to learn to punch, and boxing is a great way to stay in shape. Just wanted to say that I enjoyed your post on how to punch harder and faster. I’ve been taking boxing lessons now for about 4 months and I absolutely love it. It initially started as a way to do cardio but quickly turned into a small passion. I would definitely say you should lift weights when your boxing. It can only help. Even pro fighters lift weights. Shadowboxing is probably my favorite “exercise” to do now. Thanks for the post.